A fetal echocardiogram provides details that can be obtained as early as 26 weeks’ gestation. 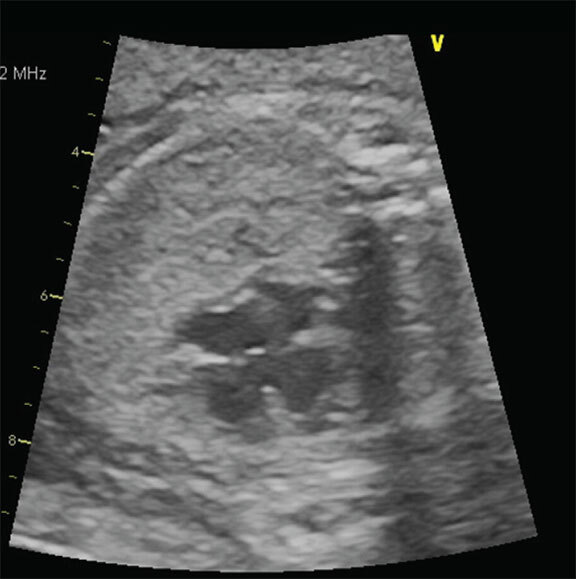 This image from a fetus with trisomy 21 shows the four chambers of the heart and abnormalities characteristically seen with a common atrioventricular (AV) canal defect. As one of the few tertiary care pediatric centers in Pennsylvania, Penn State Children’s Hospital features a Children’s Heart Group that has been an active presence in the community for decades. The Children’s Heart Group (CHG) provides fetal echocardiography, interventional cardiology, arrhythmia care, electrophysiology, cardiac intensive care and pulmonary hypertension services, as well as heart surgery to pediatric patients across the Commonwealth. Thomas Chin, M.D., chief, pediatric cardiology, explains that CHG specialists perform complex surgery on neonates and children (as well as adults with congenital heart defects) and treat more typical conditions requiring pediatric cardiology consultation, such as heart murmurs, fainting and chest pain. They also help patients transition to adult cardiac care, as more than 90 percent of pediatric cardiology patients reach adulthood and require ongoing cardiology care. In fact, Penn State Health Milton S. Hershey Medical Center has one of the longest-established programs in adult congenital heart disease in the U.S. Pediatric and adult cardiologists collaborate to care for patients with heart defects, as well as the cardiac concerns they develop as adults. This continuum of care begins in utero, when the bulk of congenital heart defects are discovered on routine screening ultrasound scans. Fetal echocardiograms can be performed at outreach centers across the state – in Harrisburg, Hershey, Reading, Scranton, State College and York – and analyzed by CHG specialists. In addition, CHG provides care to underserved communities. For 17 years, CHG physicians have led medical mission trips to care for children in Ecuador and to train cardiothoracic surgeons and cardiologists. Closer to home, CHG clinicians also support the local community. This year, CHG and the American Heart Association are collaborating in a local six-county area, co-sponsoring a public school educational program to promote a healthy lifestyle through diet, nutrition and activity. Through this partnership, high school students are given an opportunity to learn hands-only CPR®. Selected students are given an opportunity to shadow a physician, nurse or hospital administrator to learn about the health care profession. In addition, this year CHG will host a new cardiac kids camp– Camp Lion Heart. The camp is committed to a “focus on the ability and potential of our patients, rather than on their disability” – a philosophy that is the hallmark of CHG.